While the majority (~77%) of the per merged Icelandair Group’s income is from flight operations (passenger and cargo), it also earns revenue from its investments from other airlines, travel agency, hotel and other tourism ventures. Route network refinements: Around 25% of their combined route network of 80 total destinations are overlapped. That means there may be some markets that can use a reduction in frequencies to support new routes. Timing on feeder flights to other European destinations can be reworked to maximize supply/demand and increase barrier of entry. Headquarter functions: Some areas like information technology, human resources and procurement could be combined to build commonalities and efficiencies. This would reduce overhead costs. Marketing and loyalty program integration: While the airlines will continue to operate as separate entities with different branding and products, some marketing efforts could be combined. For example, social media teams could join forces and build on their strengths on different platforms. Icelandair has a bigger presence on Instagram and YouTube while WOW Air is more popular on Facebook. 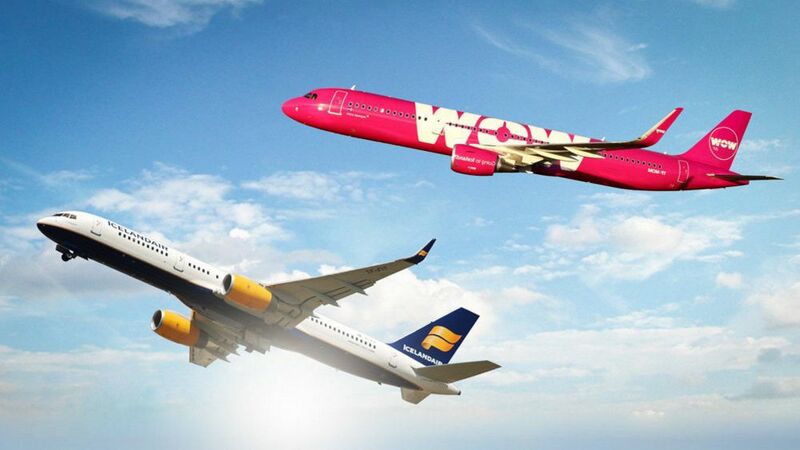 The airlines can also explore opportunities to maximize choices for consumers by codesharing, link Saga frequent flyer programs to improve the value proposition on WOW Air flights, and streamline ancillary revenue generation options. Airport support: Both airlines use Keflavík International Airport (KEF) as their home base, the new group can work with the airport authority to streamline processes with the goal to improve passenger processing, flow, and service offerings. Combining airlines always have its challenges. Typically, the new airline will face additional costs for 12-18 months as it evaluates and streamlines its entire operations. Management may face morale challenges over employment uncertainty and cultural differences in the short term. Both airlines may have received incentives from airport authorities to start new flights, they are obligated to complete these terms before Icelandair Group can end any unprofitable routes. Any previous route announcements (such as to Vancouver International Airport (YVR) or Orlando International Airport (MCO)) could be delayed or shelfed which could impact passengers with a purchased ticket. Speaking of passengers, any route elimination may lead to higher ticket prices as supply and competition decreases and are not backfilled. Icelandair and WOW Air’s rapid expansion chiefly contributed to a 28.3% increase in passengers to Keflavík International Airport between 2016 to 2017. The airport added seven new gates in 2016 and had forecasted total passenger count to improve from 8.75 million to more than 14.5 million by 2025. As such, the airport authority created a master plan that would add significant number of gates and possibly a third runway within the new 7-10 years to accommodate this group. This masterplan may need to be re-examined now that there is only one airline group though likely wouldn’t change as growth will likely to continue amid at a lower pace. Additionally, downstream supplies like tour agencies and hotel operators may experience smaller than forecast growth as the new airline pare down some unprofitable international routes in the near future.